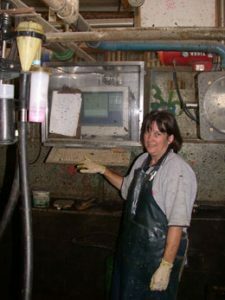 MISTRO Shed is an easy-to-use dairy farm software application specially designed for use in the dairy pit, or rotary dairy. The aim of the product is to connect you to your MISTRO Farm data in the dairy, while a wireless network connection allows you to view the same database using MISTRO Farm in your lounge room. The software is designed to run on a personal computer housed in a waterproof cabinet accompanied by a waterproof keyboard or connected to a touch screen. The software is designed to work efficiently using the keyboard alone, or using the clicks of a touch screen alone. The screens use large fonts so they are easy to read in the difficult environment of the dairy. MISTRO Shed is fully integrated with the existing MISTRO Farm program, and is used to control the MISTRO Draft system allowing for the automated drafting of cows. MISTRO Shed requires MISTRO Farm to be installed and will not operate without it. Recording treatment events, cows on heat, and other cow data on the spot in the dairy. Tracking which cows are currently undergoing treatment. Tracking which cows are freshly calved or waiting to return to the herd. Drafting cows when connected to the MISTRO Draft system. We will be working to make MISTRO Shed an essential part of your dairy business by keeping it relevant and up to date as technology develops and taking advantage of future linkages between other MISTRO software products.